When we think of thatched roofs we associate it with quintessential Britain and who is more quintessentially British than William Shakespeare. It is then perhaps even more fitting that his wife’s cottage, none other than Anne Hathaway, is perhaps one of the prettiest and best known thatched buildings in England. Anne Hathaway’s cottage is likely to be an image we have all seen before featuring upon postcards, calendars and coasters the length and breadth of the country, it certainly is iconic. Thatching was once a common and widespread type of roofing but as new technologies and practices were introduced the art of thatching began to die out. The iconic look and style is still of course practiced and taking a drive through any country village you are likely to be dazzled by the beauty of this iconic roofing style. But as straw and reed gave way to brick and mortar the once widespread house building technique began to fade out. 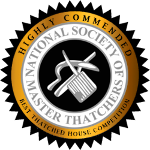 However over here at Heart of England Thatchers we believe in the importance of maintaining and up keeping the properties kept in this iconic style and maintained by this noble profession. In our humble opinion the prettiest and best known thatched building in Britain has to be that of Anne Hathaway. 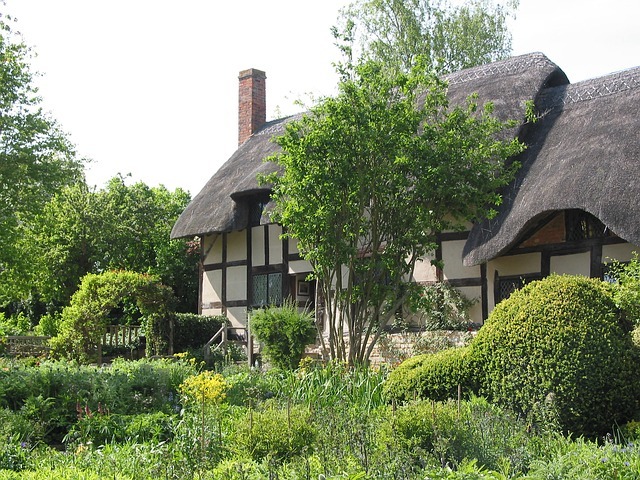 Wife to William Shakespeare in 1582, the iconic cottage has stood for over 600 years. Usually referred to as a cottage it is interesting to note that the building is a lot larger than what one might associate as a cottage. This is shown by its numerous chimneys designed to spread heat throughout the house and reduce the chances of thatch fire. It is also interesting to consider what thatching material is often used. Geography played a large role in the type of thatch a house will have, straw and reed particularly popular choices due to their sheer abundance. However water reed is most commonly found in rivers and lakes so of course location close to water supplies played an important role. With technology and transport links far more advanced in this day and age, materials can be sourced from all over the world. Thatchers would also traditionally use materials that were available to them at the time, heather, turf, sedge and grass have also been used in thatch building. The property is now owned by the Shakespeare Birthplace Trust and open to the public as a museum. Should you wish to explore this beautiful style of build while also visiting a beautiful part of England itself in Shottery, Warwickshire then we would definitely recommend this piece of iconic quintessential British history. Here at Heart of England Thatchers we provide professional thatching processes of the highest quality and standard of care. Our diligent care and attention will ensure any thatch we work upon will be completed to the highest standard.